Let’s get one thing straight. I don’t know anything about women’s wear. Nothing, nada, zip. But I am interested in the crossover between menswear and more classic women’s wear. 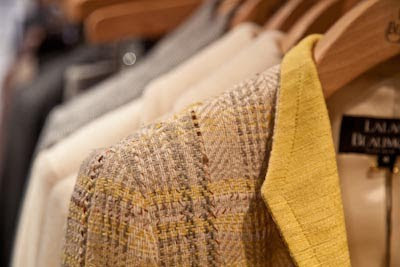 The older the woman and the more classic her taste, the more her coats, jackets and shirts are influenced by menswear. Both are dependent on detail. The styles have to be classic so the focus is on material, shape and little touches of personality. Lalage Beaumont is a case in point. The key features of her pieces are always cloth, buttons and cuffs. Strong colours are kept in order by complex tweeds and textured silks. The back of her jackets and coats are rarely plain – whether it be a full belt or a decorative string of white rope. Buttons are handmade and unique. It’s like menswear taken to an ornamental, colourful extreme. Where a man’s tweed experiments with tiny, subtle touches that get lost in the whole, these women’s versions weave in ribbon and frayed ends. 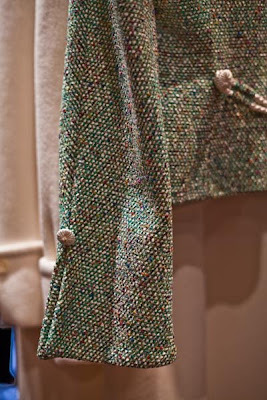 The green tweed shown here, from Clarenson in France, includes in its materials cotton, viscose, silk, polyester, polyamide and polyurethane. It’s a little bit more exotic that plain wool. 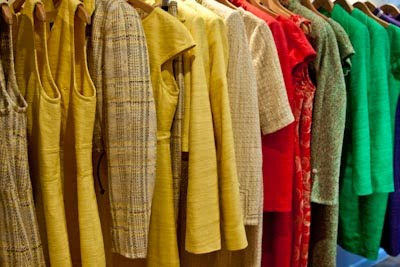 The yellow tweed (top) is closer to a man’s jacket – from Lynton Tweeds in Carlisle. In a mossy green it wouldn’t look out of place on Savile Row. But woven in there are similar variations in material and texture, bringing a level of decorousness that is central to women’s wear. 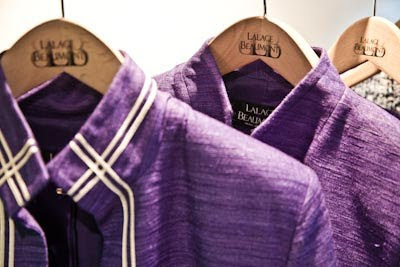 I was interested in the silk dresses and jackets too, the purple ones pictured here being from Lalage’s Spring/Summer 10 collection. She points out that the texture of the silk enables her to use very bright colour – the ribs and grain of the weave ground the colour in the same way as the tweed. You can also see the flip-back collar, split cuffs and woven buttons. The parallels with menswear are obvious. Paul Smith used similar cuffs on his suits last season. And something in me wants buttons like that on a blazer. This isn’t really surprising given that Lalage spent most of her career designing both men’s and women’s wear. Her first role was at Aquascutum. They sponsored her last collection at college and, when she left, offered her a design position. After quitting briefly, and spending that time teaching as well as freelancing at Burberrry, she returned to Aquascutum as chief outerwear designer. That was being thrown in the deep end, but she learnt a lot about the commercial and international side of the business. Like what other countries think is English – for Germans its loud checks, for the Italians it’s far more conservative. “All the Italian women would want was a two or three-button jacket, with slanting pockets and vents. A hacking jacket, basically. You could vary the cloth, but that was about it,” remembers Lalage. Ten years at Chester Barrie followed, launching women’s wholesale and bringing a lot of men’s construction techniques – such as canvassing and cut – to that range. Again the ‘county’ look was what European women wanted and that was when Lalage developed her interest in men’s details: turn-back cuffs, Prussian collars and Great coat-like belts. She was head of ready-to-wear at Mulberry for two years, both men’s and women’s, before working in New Zealand as a merchandiser. Then five years ago she launched her own label, now based on Avery Row just off Bond Street. Don’t worry, I don’t foresee many other pieces on women’s wear. But it’s interesting to explore the influences of our subject. You can follow the discussion on Crossover with women’s wear: Lalage Beaumont by entering your email address in the box below. You will then receive an email every time a new comment is added. These will also contain a link to a page where you can stop the alerts, and remove all of your related data from the site. It’s so refreshing to read about women’s clothing in terms of quality, materials, construction and design instead of “fashion” (or whatever passes as fashion at the moment). Do you think there are any women’s blogs written in this style that you or other readers could recommend? I’m dreaming of a “women’s permanent style” or something of a sort. This is a nice post. Women like to check the quality of their clothes and also the texture. They value it.